Hi all! Today is a super exciting day for us because we are finally releasing the full, refined, repolished, awesome experience! Have a check at our trailer! 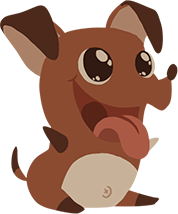 If you like what you see, grab the game at itch.io . We've gone with a pay what you want model, and as such the game is completely free! Of course, we'd love if you enjoyed playing our game as much as we did making it that you leave us a tip! We were originally intending to go with a flat purchase price, but we ended up going with pay what you want because we decided we'd rather put this bit-sized experience in the hands of more people than have people turned off by a purchase price. We offer a Windows, OSX, and Linux build of the game. Windows does have the most support on the dev end so please tell us if you run into any issues with any of the builds! Hope you guys have fun blasting lasers and flying through space! Previously we had only two aliens creatively named "Big Eye" and "Two Eyes". But today we bring you 4 new additions to the arsenal! 4 new aliens that need new names! 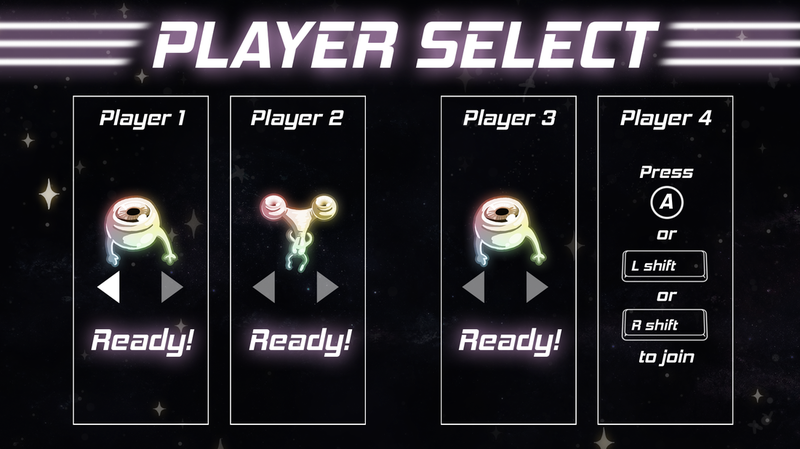 ​Alien selection is purely cosmetic and really only serves to differentiate yourself from your teammates. But it's a fun feature nonetheless. We don't currently have names for these guys, if you can even call the names of the original two names. But there are some behind the scenes descriptions of them. 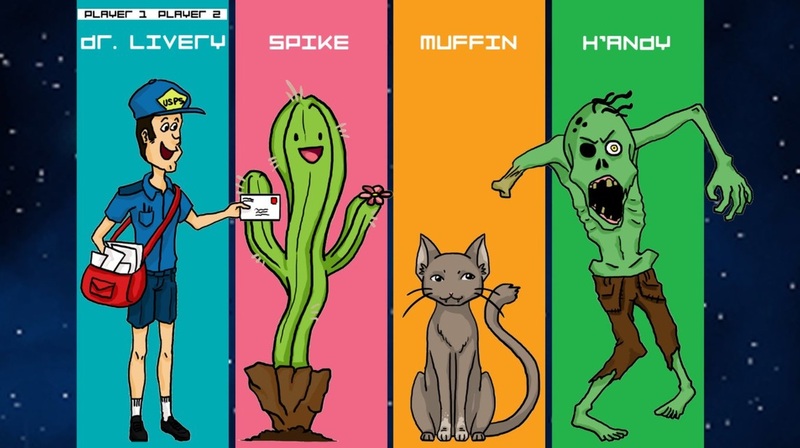 Perhaps you guys will come up with something more interesting than "Fuzzy alien" or "Springuy". We also have a snapshot of our music. Alien Evaders features 7 different tracks all by RoccoW which are all generously licensed under CC-BY 4.0. We chose these tracks because they have a great upbeat action feel that goes great with frantic color matching. And being an arcade-style game of sorts, the low-fi music seemed like a perfect fit. Here are two of our favorites, and we hope you look forward to hearing the remaining awesome tracks during gameplay! Let me take a few minutes to talk to you about Alien Evaders. 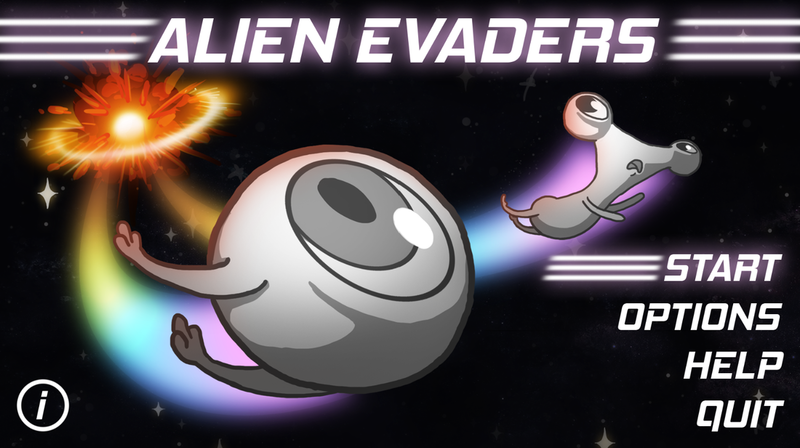 Alien Evaders is a game that was born out of a gamejam, Purple Monkey Gamejam to be exact! If you're curious, you can take a look at the other entries from the weekend long, in-person, event here https://itch.io/jam/purple-monkey-game-jam-march-2015 . The theme was "With our powers combined!". 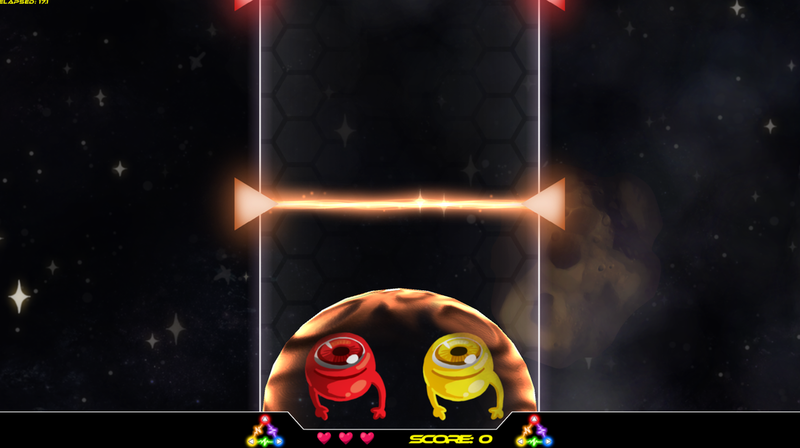 Alien Evaders follows this theme by forcing two players to cooperate to control their shield color to safely pass through and destroy obstacles. 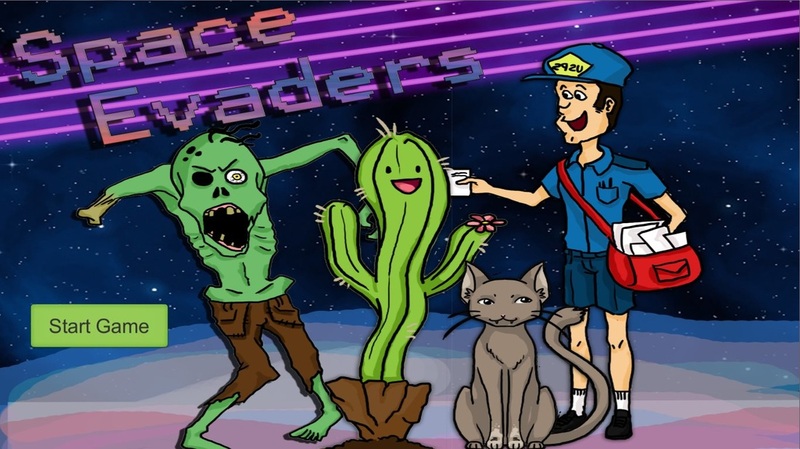 If you checked out the Purple Monkey entries page, what you might notice is that Alien Evaders was quite a bit different. For starters, it was called "Space Evaders", a not so subtle pun on Space Invaders. And you'll also notice if you've got a keen eye for art (/s) that it looks a bit different as well! Yes, that's what working with 3 different artists, with only a list of tasks and little communication regarding style and cohesion will get you: a muddle of gamejam art. While fun, silly, and lighthearted is what we were going for - and I would say achieved - confusing, strange, and outright sloppy were not our goals. The characters were each designed by different people and our 'personal touches' definitely show. Another issue we had was agreeing on the actual production style. Some of the art was drawn on paper and colored with watercolors, while most of the rest was done in Photoshop. We ended up digitizing and cleaning up everything in the end, but the difference definitely shows. And really our main shortcoming during the jam was having a sheer lack of knowledge. For all of us this was the first game we had really tried to take from inception to completion. Previous works had just been playing with little bits of code, or individual assets. For more than half the team, this was the first foray into game dev whatsoever. Things like menus and UI, and effects you can see really suffer from this. Lucky for us, we learned a lot from the experience of arguing and smashing our computers in frustration. A big thing was learning to work as a team. We improved our workflow and communication and most importantly learned to make compromises in both production and design. The new and improved, and artistically cohesive game! You can see the game has kept its lighthearted characters but the one armed flying zombie, and the postman from another planet, have been replaced by two cute aliens that hold their own in their environment, and with each other. The overall look and feel has been swapped for something a little more clean, and dark to aid with color identification. The old backdrop had so much going on that it became a little difficult to identify the laser colors. The new one is much simpler, and the dark general color really makes the colors pop. It's much easier to focus on the gameplay rather than fighting all the unintentional visual distractions. The effects have also changed, and improved, a lot. The former effects were pretty constrained to a fuzzy circle using a variant of Unity's default particle system. The big blockbuster effect was the explosion when a player dies and that was lackluster to say the least. Now, the game takes full advantage of the particle system to create several different types particles: background stars, background fog, laser sparkles, and explosions. And it even incorporates some new techniques we've picked up for scrolling textures, and shaders. All-in-all, this game has come a long way from its inception. The original is still up for free download on itch.io, where the new game will soon be available for purchase. We encourage you to download it, give it a try, and grab a friend! If you're wondering how the purchase will differ, wonder no more. 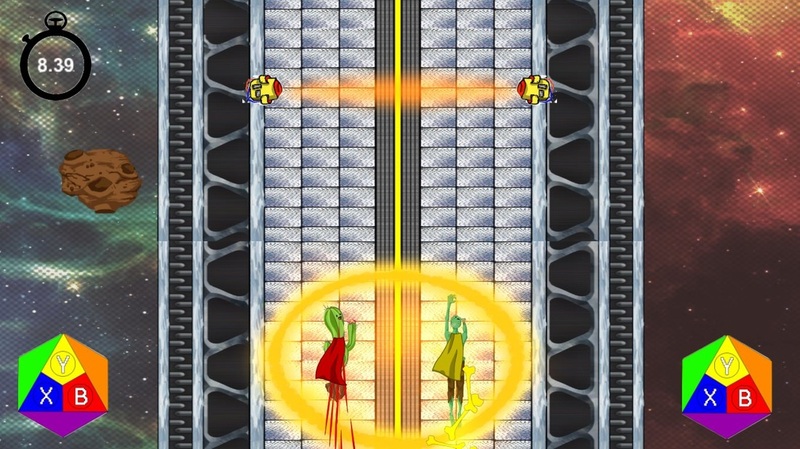 The old jam version does not contain competitive 2 lane mode. And it's got a handful of bugs that we didn't get worked out before the jam's conclusion. Aside from aesthetics, the new version will offer better controller support, with support for up to 4 players. It's generally a smoother experience, and more pleasant to replay over the course of time. Thanks for taking the time to read about the history and the making of Alien Evaders!